Few vehicles do as many things as well as the CR-V. As practical as a backpack, this benchmark crossover is an easy, one-size-fits-most car choice. The many reasons why I love my Honda crv. This is a very comfortable car. It holds the road well in all weather conditions, is easy to maintain, visibility out all of the windows is good, passengers are comfortable, seats lay down for more room to transport large items, road noise is a little louder than I care for but is not unbearable. Cost of maintaining the car and is affordable, repair services are easily obtained. My insurance rate on this vehicle is reasonable. Gas mileage is good even for a smaller SUV. We travel with a toddler, getting her car seat in and out of the car is strapped in is very easy, and she appears to ride comfortably and safe. Appreciate the child locks on the doors to keep the children safely in the car. All of the common amenities that came (stock) with the care are all reasonable, the stereo and cd player work well, sun/moon roof is good. Love the colorful dashboard lights that illuminate all the dash indicators, especially in the night time darkness, and if we go thru a tunnel or darker area, the automatically light up, also, the headlights come on automatically when the car is started. I just really enjoy driving and riding in this vehicle. Honda CR-V customer for life. Excellent performance and I feel it is reliable. Extremely comfortable, and I have driven from Virginia to Texas and back several times. Handles well in inclement weather, granted I have new tires. I get regular maintenance so I have few mechanical problems. I feel it is a safe, sturdy vehicle, and I prefer a higher vehicle on the road so I have good visibility. It is extremely roomy and at times I carry a lot of baggage when moving from state to state. Sound system is also good. Easy operation of all features, including cruise control, etc. 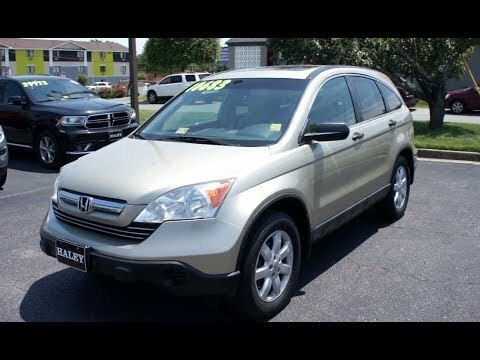 Overall I am very satisfied and would buy another Honda CR-V for my next purchase. I have over 150, 000 miles, but I feel like it will go another 150, 000, especially because I just put a brand new a/c unit and it works fantastic. Reliable midsize SUV with easy to clean leather interior that is efficient and comfortable. I have a light blue Honda CR-V EXL with gray leather interior. It has a radio, CD player, and capability for xm radio. The car comes with cruise control and a sunroof. I have had to replace the battery 3 times since owning it and the tires 2 times. The only problems I have had have been in the interior of the car. The leather arm rest on the drivers side has begun to peel and crack after many years of use. The carpeting on the floorboards had also begun to wear down. The car has maintained its comfort otherwise. I consider it to be very reliable and have had few issues with it that were not caused by an accident or weather.